Did you know you can now order your Deliveroo takeaway from Randall and Aubin here on View? Randall and Aubin is a sophisticated restaurant with a relaxed atmosphere and a wide variety of dishes available on the extensive food menu. Do you work at Randall and Aubin? What did you think of Randall and Aubin? Went back to Randall and Aubin after a friend introduced me to it a few months ago. The staff are lovely - extremely friendly and helpful. The food's not bad either. Will definitely go back to Randall and Aubin again and again - it's great! I have been passing this place but aways packed, came out from the cinema, and 2 places looking out onto the street were available. The waiter then has to go onto the street to serve you, whilst you people watch the Soho crowd, sipping wine, eating the bread and olives. The Crab salad was excellent, the Calamari was ok nothing special, the service was excellent, as is the location. Soho has many sides to its personality, and among the partygoers and clubs are a few real hideaways that hark back to the days when Soho was quirky and just a bit special. Randall and Aubin reminds us firmly of this. 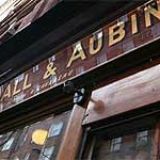 Randall and Aubin is located within an old butcher’s shop, and that goes some way to explaining why it has such a feeling of authenticity. For a start, the exterior is incredibly inviting, with a large black canopy, swirling signage, and old wooden front with large windows offering glimpses of what’s going on within. And inside is very cool. A neutral colour scheme punctuated by lots of warm wood is given a hint of glamour thanks to the long marble-topped bench seating complete with high-backed stools, chandeliers, black and white photos, and neat displays of the restaurant’s wares, including an iced display cabinet showing off all the fresh fish and seafood. Sure, it can be a little cramped and you may have to share a table with – gasp – strangers but hey, this is Soho, after all. Randall and Aubin has a cosy authenticity to it that is very hard not to be charmed by. 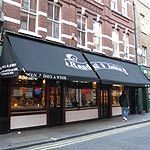 This is a place that is quintessentially Soho without trying to be, so the atmosphere is laid back, full of chatter and laughter, and is just... well, nice. And the staff are incredibly friendly and welcoming, offering a spot of banter between courses so you’ll barely notice the sometimes overly-long wait for food. Funky house and even a disco ball give a little nod to the area, and you do feel just a little bit special when you see a long queue beginning to form outside - get there early. 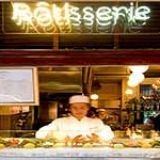 The menu (from Ed Baines) is unpretentious French food with a focus on high flavour, although the prices aren’t the cheapest for Soho, with starters priced at £8.85 to £18.50 and mains £10.85 to £27. However, if you’re smart with what you order then you can enjoy a good meal here without maxing out the credit card. For example, a starter of one of four soups costs just £3.25. And the tomato and sweet basil soup is actually very good. Well seasoned, nicely thick and with a sweetness that’s tempered by the peppery flavour of the basil, it’s definitely a wallet-pleasing winner. For mains, a very decent roast pork belly with apple sauce (£11.50) comes with a side order of your choice and gravy. Well portioned, the pork belly is meaty, a little fatty – although not unpleasantly so – and pleasantly salty. The apple sauce isn’t too sweet and it’s worth enjoying the dish with the creamy, soft mashed potato and rich, meaty gravy. Alternatively, a whole dressed crab with potato salad is just £14.85 and the crab is extremely fresh, meaty and very good quality, having been well cleaned and dressed just enough to bring the flavours of the crab out without drowning it with creamy mayo and vinegar. If you do want to splash out then the oysters are particularly good, with twelve exceptional Natives coming in at £24. Well worth it if you're feeling flush. Although the majority of the sparkling wines and Champagnes are French, it’s a shame that they don’t have some cheaper French bottles on offer, instead of allowing (perfectly decent) New World options to pick up the cheaper slack. The prices are good, ranging from £16.95 to £49, increasing to £255 for the most expensive bottle of Champagne. And if you don’t fancy wine then they offer Guinness, Budvar, Becks and Stella. 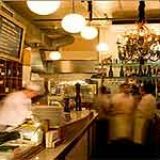 Randall and Aubin may not be the cheapest restaurant in Soho but for an all-round dining experience with a lot of character, it certainly excels. Over priced. Manager a diva, lures his catch in the street, then extortionate charges added to the bill. Supposedly a Sunday special of Oyster and glass of Champagne, added to the bill is bread you don't ask for or want, but is delivered to your table (it was uneaten but still charged for) and the £3.00 pp service charge when my partner had just a drink! How can you pay £9.00 for a glass of champange and a £3.00 service charge?? How else can you get a drink if its not served? So, a glass of champagne is £12.00! Go to a pub for a pint of beer for £1 then add £5.00 to serve it is the same principal. Politely ask the manager and he goes into a hissy fit!! AVOID! I think that if you were a chef you should be able to spell - mussel not "muscle" - and langoustine not "langostine" and marinière not "marinaire" ? so do not trust your comments. Taurist haunt not for the fish lover. We had a fab evening here, we were made to feel very welcome by the attentive ( but not overbearing) and very efficient staff. There was a really chilled atmosphere, the food was delicious, and the music was great. We are looking forward to returning on our next visit to the big smoke!! Randall and Aubin has to be my favourite restaurant in London. 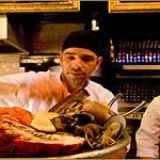 I've been going as often as I can afford for the past couple of years and the quality of the seafood and the great service remains consistantly superb. Randall and Aubin has a great vibe, super-friendly staff, good tunes, it's very lively and pretty camp! And of course the menu is great, espcially if you're a seafood lover – I've yet to find tastier fish and chips in London. On my last visit and we ate and drank for four hours. I can't believe there are no reviews for Randall & Aubin it's such a great place, especially early evening with a window bench seat. Randall & Aubin has good funky music/atmosphere and the food is good, great fish soup, fish and chips, bread and olives to nibble on as you decide. The non fish things I have had are not so great; a starter of bresaola was a bit woollen but that's the only duff thing I have had at Randall & Aubin.